U3A Todmorden heard a cracking talk from Allan Shalks on Thursday, June 21st. Enigmatically titled ‘My Interesting Life’, that’s just what it turned out to be. Inspired by his grandchildren urging him to write an autobiography, Allan has started his public talks both as a vindication of a life well led and to encourage listeners to believe that one career is simply not enough! At 10, Allan’s parents were hospitalised for 9 months following a car crash. He was looked after by an aunt in Birmingham before returning to his recovered parents in Leeds. At 14, pretending to be 17, he got a sports paper round with the Yorkshire Post, and sold the Empire News in pubs on Saturday nights. His fulltime working life began when he was apprenticed to a ladies’ hairdresser. Here he learned another valuable lesson. If your boss says clean the basin after using it, and you forget, then you get suspended for a week without pay. Engaged at 18 and on the verge of marriage, he was left in the lurch after his fiancée’s father told him he wouldn’t be able to keep his daughter in the manner to which she was accustomed. As things turned out, his reception venue was taken over by his aunt for her daughter’s wedding and there he met the young woman who would become, and still is, his wife. By 21, Allan had opened his own hairdressing salon and his wife sold perm lotions. On his off days he ran and then bought his uncle’s market pitch in Darlington. But this was not enough, so in 1970 he went to run Purcell’s Stores in Glossop. In 1983 he moved to Manchester, commuted to Glossop, and sold up in 2001. Then he got bored and started work again as a deliverer of new cars. He developed the business for his boss raising the delivery rate to 200 in 18 months. When that went sour, he thought he’d try his luck as an actor, and has appeared as an extra in ‘Cold Feet’, ‘Emmerdale’, Coronation Street’, ‘Doctors’ and many other TV shows. He has also been a body double for Tom Conti and has enjoyed the company of a make-up girl in bed which led to an explanation of the way sheets are arranged to separate bodies in such scenes. Allan has recently expanded into deejaying for Salford Radio, teaching at the Jewish Museum in Manchester and until 2014 was a Jewish function co-ordinator at The Pines Hotel in Clayton-le-Woods. “At different stages of your life you can do different things,” he said – an inspiring witness to the fact that life can begin and begin over and over if you just take your opportunities. 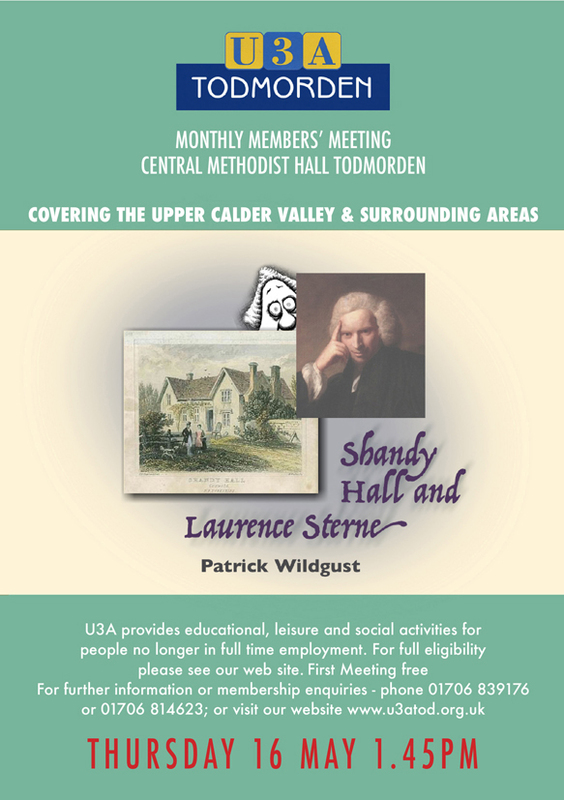 U3A Todmorden’s next meeting will be on Thursday, July 19th, 2018 in the Central Methodist Church Hall in Todmorden. This will be our AGM, and our speaker will be Professor June Andrews of Stirling University, an acknowledged expert on dementia. Our contact details are www.u3atod.org.uk (website), enquiries@u3atod.org.uk (email), or 01706 812015 (phone).